As Part of their 30 year Anniversary edition, the Brooklyn Paper has a couple of articles about Red Hook. 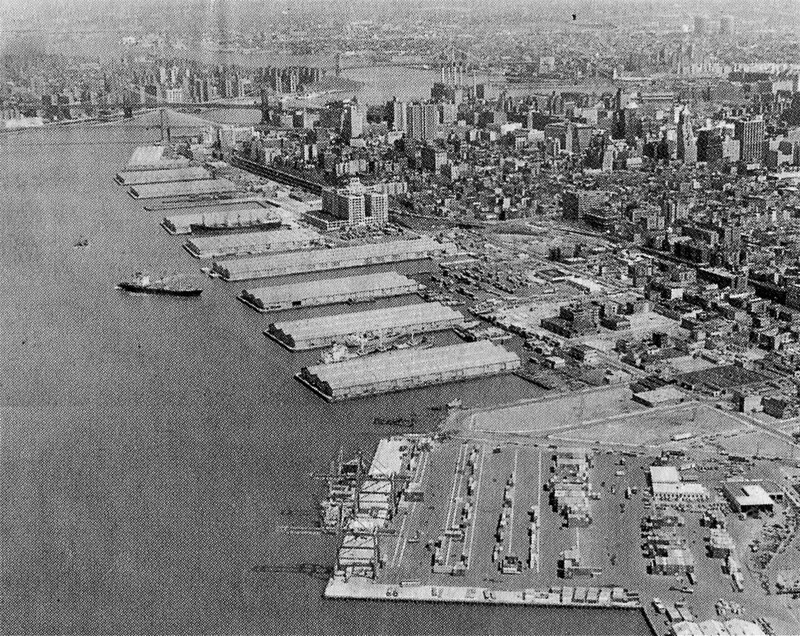 Michael P. Ventura, in his article (titled on-line, "On the waterfront, but not ‘On the Waterfront’) refers to the 1960's plan to turn Red Hook's Piers into a fully fledged, large-scale container terminal. This plan would have required the demolition of most every building close to waterfront, including houses in areas West of the BQE on the Northern side of Hamilton Avenue - what is now referred to as the Columbia Street Waterfront District. As we know, the large scale containerization plan never came to be, with most container operations being drawn to New Jersey, its greater "upland" area and connection to the national railway system. In fact, someone once explained to me that if Red Hook's Container Terminal was to create the same amount of "upland" space required for the storage of the containers as the Port of Elizabeth, the entire area between the waterfront and Prospect Park would have to be flattened. A quick Google Earth comparison of Red Hook terminal's tiny footprint to the vast acres of upland space at the container ports on the New Jersey side would seem to confirm that bewildering statement. 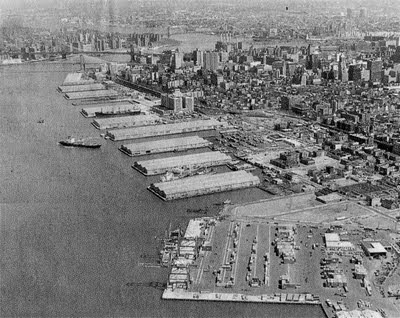 But, as noted by Ventura in the earlier piece, the failed containerization plan became a defining moment for Red Hook initiating a period that, he says, "hit hard". A time from which the neighborhood is still "struggling to recover". It was a period that led to the halving of Red Hook's residential population and the blighting of the neighborhood, seemingly giving Red Hook the green light to become, by the 80's, as described by Red Hook Civic Association Co-President John McGettrick, "the city’s dumping ground" - complete with 20 waste transfer stations, two planned sludge processing facilities and a dirty cement plant, located at the site of the ATF Building, alongside what is now Valentino Pier. John McGettrick goes on in the article to note that most of what has come in the 20 or so years after this period has been an improvement. One waste transfer station remains, but the neighborhood fought and won the battle, lead by the group G.A.G.S. (Groups Against Garbage Sites), to keep more more garbage dumps out of the neighborhood - a plan pushed by the Giuliani administration. The old cement factory was closed down, replaced by the ATF building - it's chain-link enclosed parking lot has some of the best views of New York Harbor! - and the neighboring plot of waterfront land eventually became the much loved Valentino Pier and Park. There have been other contentious matters. The coming of both Fairway and Ikea created concern and protest. 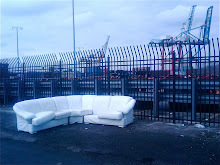 Ikea, because its coming into the neighborhood came at the price of destroying historic waterfront infrastructure - the graving dock - and the questionable use of valuable waterfront land. 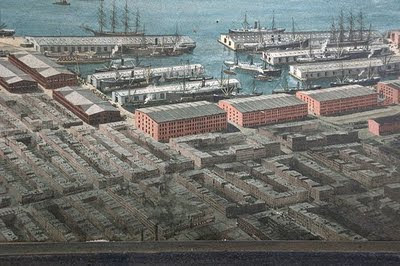 There were also worries because the store was seen as a harbinger of more "big box" stores on the Red Hook waterfront. We'll wait to see if those fears are realized with the Thor Equities plan for a BJ's on the old Revere Sugar site. Also, cement plants seem to be back on the list of Red Hook businesses after the announcement of the unpopular plan to establish such an operation on a plot of land next to Ikea, the Erie Basin Park, across the street from Added Value Organic Farm, Red Hook Ballfields and on the proposed Brooklyn Greenway route. After outcry about the inappropriateness of the site and the adverse effects of the cement dust and pollution on the neighborhood's residents' health, children playing in the fields and the organic farm, the City and State have said that they will be keeping the plant on a "short leash" (Gary Buiso's Brooklyn Courier story here). Again, we'll have to wait and see on that one. However, it's the been the proposed uses of the Red Hook Piers that have most clearly defined the direction and vision for the future of the neighborhood. The proposed uses of the site have varied from the previously mentioned disastrous plan to raze the whole neighborhood and create a huge container terminal, to the much more recent 2005 proposal when Mayor Bloomberg and the NYC Economic Development Corporation (EDC) were pushing for a plan that would have replaced the existing, much smaller container port occupying Piers 7-12 with other uses. The 2005 plan was created in response to goals set through consultation with the community and articulated by Community Board 6 and Red Hook's 197a Plan. It included some new residential buildings on Columbia Street, a Cruise Terminal on Piers 12 and possibly another on Pier 10, a hotel, extensive public access, open green space, as well as other "maritime-themed" activities (sailing school, marina, boat building and other vendors and artisans) and expanded transportation options - water taxi, ferries, etc. This plan got as far as the establishment of the Brooklyn Cruise Terminal on Pier 12 (opened in 2006) and the acquisition of Pier 11 on the Atlantic Basin, but in late 2007 the rest of the plan, like the previously mentioned one, was abandoned. The political pressure from various supporters of the Container Terminal's operators, American Stevedoring - ASI, (some who were also recipients of campaign contributions from ASI), including Rep. Jerry Nadler, Councilman David Yassky and Speaker Christine Quinn (story here) and their cries about the loss or relocation of the 70 or so jobs that the terminal supported, seemed to dissuade the Mayor and his team from going any further. The Container Terminal and ASI would stay. American Stevedoring's continuing operation of the container terminal was secured soon after with a new 10-year lease (no-one else was allowed to tender for the operation), and new leadership at the Maritime section of the EDC pushed for a whole new plan for the remaining section of the waterfront not leased to ASI - essentially Pier 11 and the Atlantic Basin. The new team at the EDC apparently thought of the City's previous plan as a "yuppie wonderland" - their words, not mine - and they stated that their goal was to "consolidate and expand" the operations of the Container Terminal. Anyone who has been paying attention (or reading this blog) knows what has happened since with the EDC's contentious plan, announced earlier this year, for the relocation of Phoenix Beverages to the Brooklyn Piers - taking both Pier 7 and 11 and their sheds (despite only initially wanting either one OR the other) with a 20-year lease and bringing 200 more truck trips a day to our neighborhood. The Atlantic Basin water space is not being used by Phoenix. However, in a small concession to the call for waterfront access and open space, PortSide New York has been allocated a 600 foot frontage on the Basin, as well as being given a portion of the Pier 11 shed to use for their home base. They will be mooring their ship, the Mary Whalen, in the Basin and will be using the historic vessel to mount their cultural activities and community outreach programs. There has also been a commitment to allow the Brooklyn Greenway to build their route along the waterfront instead of pushing it onto Van Brunt Street, as the EDC had previously wanted. Looking forward, it is still this small portion of the waterfront that has the potential to create a lasting effect on the community of which it is a part. What else can come to the Atlantic Basin? Will there be a call to create more activities within the Basin's "blue space"? 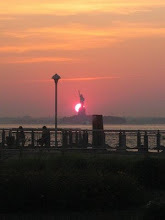 What about the establishment of water-borne transportation based within the basin - Water Taxi, Governor's Island Ferry? Could the underused asphalt parking lots surrounding the Cruise Terminal and Pier 11 be used for community activities - stalls, markets, etc? Will we demand more access to the waterfront - especially around the Cruise Terminal - and will we advocate for the creation of some open space to enjoy the waterborne activities, as is seen in other parts of the world? Will there be further consideration and assessment of ways this valuable and historic asset can be used to nourish the growing number of Red Hook residents, to attract more people to visit the neighborhood and to bolster the small businesses and resident-entrepreneurs popping up all over the neighborhood - including the many resident-owned stores, old and new, along Van Brunt Street and beyond? Will the owners of the dormant 160 Imlay Street building overlooking the Atlantic Basin site take advantage of its zoning, and turn it into a home for new residents and a place for commercial use - maybe even live-work space? Additionally - and this is my personal cause - will the EDC, Port Authority, City of New York and all involved finally come good on making sure the activities of the port don't pollute the residents who are their neighbors. Will they get "shore power" established for the cruise ships and container ships to finally put an end to the negative impact of their carcinogenic diesel smokestack emissions on our residents? Will they get a clean truck program up and running, as they are doing successfully in Long Beach and elsewhere on the West Coast? (story here). Surely economic development shouldn't happen at the expense of the health of our most vulnerable residents. "The future of the Brooklyn waterfront is tied to and intrinsically linked to our ability to rebuild Governor’s Island,” he said “We must look at Governor’s Island as a takeoff point. Ward recommends that the containerport be moved south to 39th Street in Sunset Park in space where automobiles are shipped in and stored now." Mr. Ward hasn't exactly followed through with any more statements on this matter. Regardless, will it be these "outside" entities making decisions (or not) for our neighborhood, or will the Red Hook community speak clearly and strongly for what it wants? Whatever happens, as always, it's surely the use of the precious Red Hook waterfront that will continue to determine the character of our neighborhood. Thank you Adam for your dedication to this issue, for being mindful of the past, while encouraging us to look forward. Mr.Ward worked for American stevedoring before he got the position at the port authority.NADLER,YASSKY,WARD how could you lose. you should talk to the residents who been there for 60 years.